While it was difficult to tear myself away from the mystical deserts of Rajasthan, the hills of Bhutan were calling my name. Traveling via Delhi, I flew to Guwahati in Assam where my driver Gempo, guide Tenzin and Ambassador Lhatu Wangchuk’s nephew joined me. 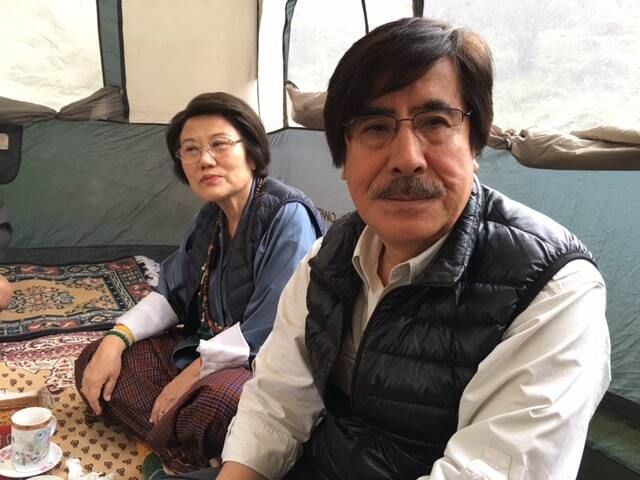 The Ambassador and his wife Sangay were meeting me near the Bhutanese border. 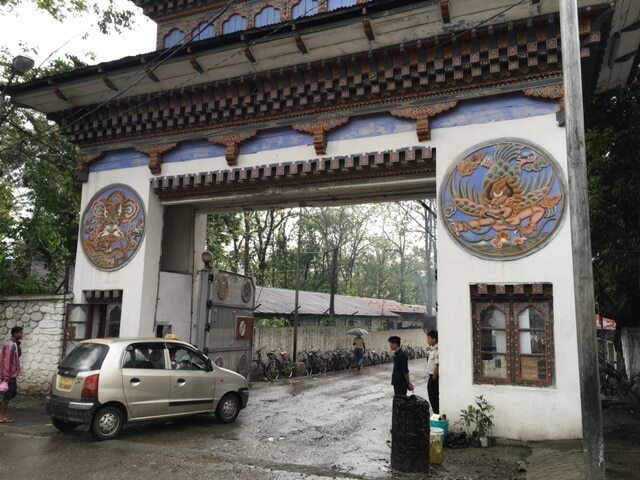 This was the wonderful border gate between India and Bhutan that we drove through near the town of Samdrup Jongkhar. 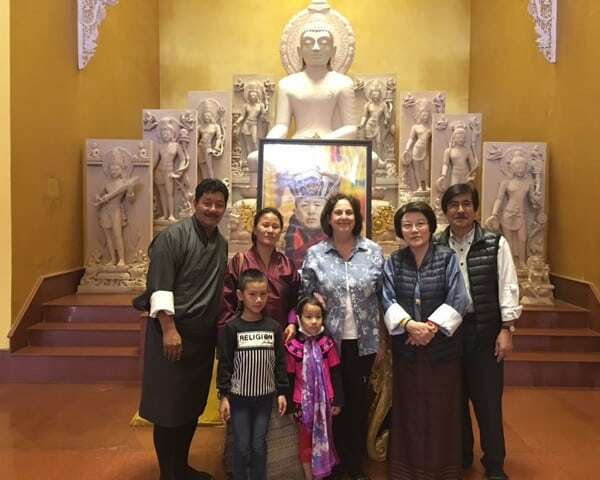 We met up with the Ambassador and Sangay at the Mending Hotel in Samdrup Jongkhar, where we had a well deserved restful night. 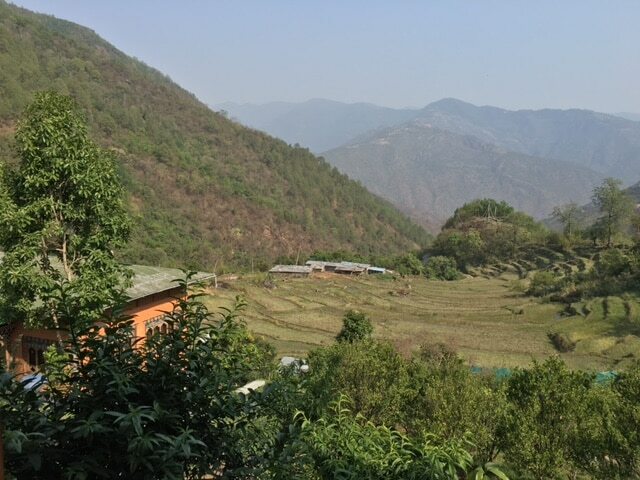 Early the next morning we all set off to Trashigang, a small but bustling town located on the Drangme Chhu River. The town hosts the rather imposing Trashiganag Dzong, known as The Fortress of the Auspicious Hill that is credited with helping Bhutan retain hold of the eastern part of the country for over 300 years. On the way we stopped at a new Buddhist temple that had some stunning chandeliers. 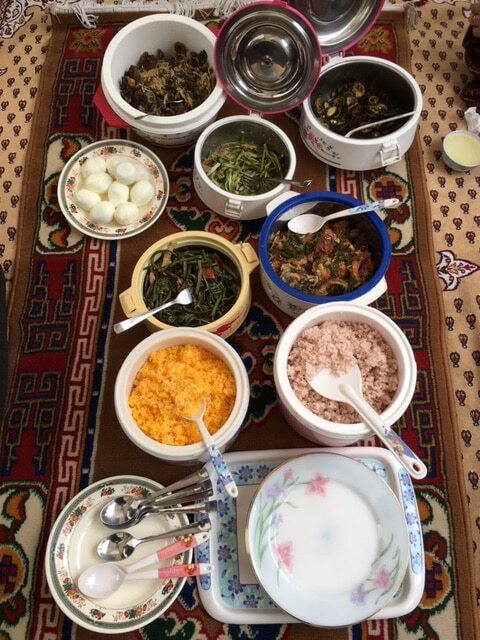 We’d certainly worked up an appetite by this stage, so Ambassador Lhatu’s sister and nephew graciously prepared a delightful picnic lunch for us. Amidst a peaceful meadow they set up a tent for shade and laid out a feast of delicious refreshments. 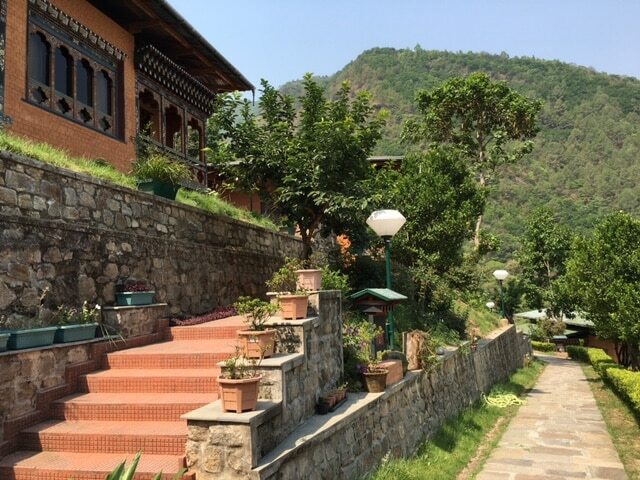 We continued on until we reached our destination for the evening, Lingkhar Lodge in Trashigang. This comfortable lodge had some lovely spaces where we could sit outside and enjoy the beautiful view over the valley. Thanks to the tender care of the owners, the gardens of the property were blooming with brightly colored flowers, fruit trees and shrubs. The air was fresh and the environment so very relaxing. The next day was one of my most memorable for the trip. 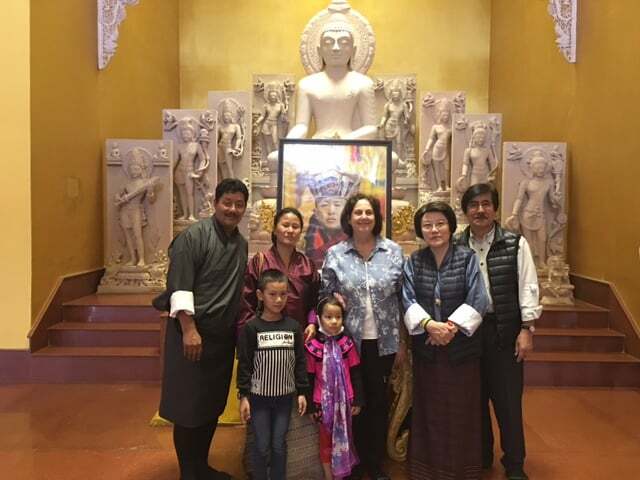 I was privileged to spend a day with Ambassador Lhatu and his lovely family, experiencing Bhutanese hospitality firsthand. We started the day with tea at the home of Ambassador Lhatu’s cousin. Everyone was jovial as we looked forward to the day ahead. We then moved on to meet his sister who had invited us for lunch. 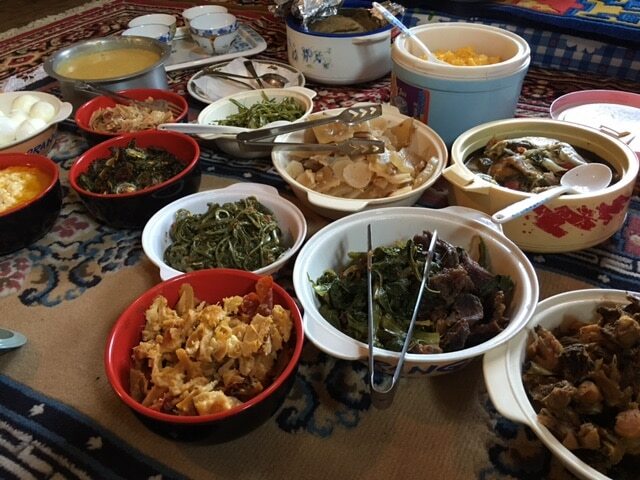 Her son is a school teacher in the area, but he is also a fine cook, and spoiled us with his treats. He had also prepared the picnic for us the day before. While this rural farmhouse had no furniture, it was very warm and inviting. We all sat on comfortable rugs that were laid out in the living room. 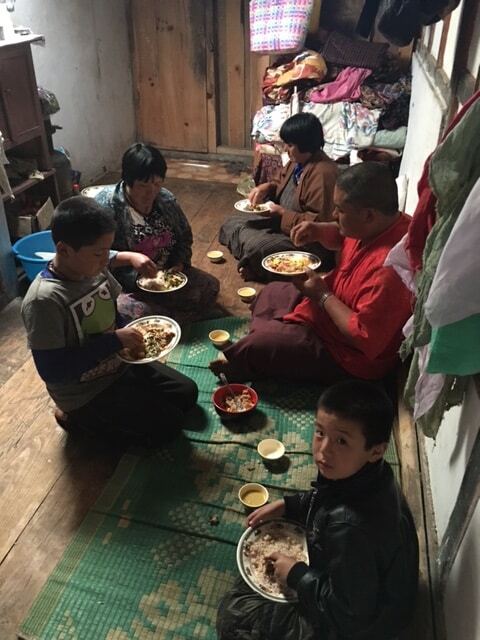 The lunch was a scrumptious banquet that had been cooked using fresh vegetables from their own garden. Just outside were spectacular views across the valley and to Ambassador Lhatu’s ancestral home in the distance. Nearby we went to have a look at Yongphula airport which is currently being renovated with a new airfield being added as well. The airport is expected to reopen at the end of 2017, which will make the east of the country much more accessible. 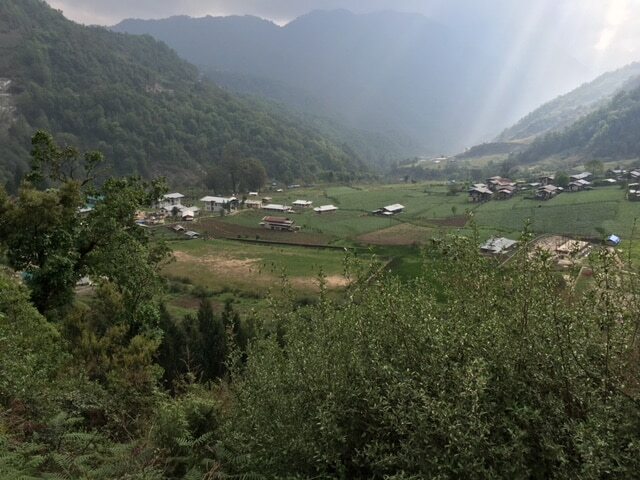 It is anticipated that flights from here will take people to Paro and Bumthang. With full hearts (and bellies) we headed back to our hotel for a restful night before the busy day ahead. I’ll tell you all about that in my next post.